They dynamic duo – Mike Burns (l) and Steve Czelusniak (r). Back in 1993, Steve Czelusniak biked in cotton t-shirts, wore a heavy helmet and had toe cages on his bike. He was a novice cyclist who began to love biking after he signed up for his first Anchor House Ride for Runaways. After he moved from Maryland to Trenton, he read about the ride in the newspaper and he has been pedaling ever since then. One year on the ride and he was hooked. He has never missed a year, and looks forward to the ride every summer. The cycling journey is made a easier with the camaraderie of has a loyal biking partner, the Rev. Mike Burns of the Roman Catholic Diocese of Trenton. The two met a decade ago when Czelusniak needed a new roommate on the ride and then discovered that they were also compatible as cyclists. “We both like to get out early and our pace is pretty similar. I’m a sinner and he’s a priest, so it works out well for both of us,” Czelusniak said. “He leads the way and does all the work, while and I ride behind him,” Burns said. The 146 cyclists on the Ride for Ruanways bike at different paces and each cyclist has a routine. Some cyclists like to get an early start and others leave a few hours later. Some cyclists take lots of breaks and others don’t. Czelusniak and Burns are often the first two people to make it through the first rest stop of the day. They like to get out early get ride done, then go look for something to eat. The duo rarely trains together though because they have different schedules and don’t live in the same area. Until recently, Burns was the priest at St. Mary’s in Bordentown. He retired last week, and will turn 70 in August. Czelusniak, 61, lives in Ewing with his wife, who teaches at Community Park Elementary in Princeton. “I hope I’m in that kind of shape in nine years,” said Czelusniak, motioning to Burns. Asked is he will try to match his partner and do the ride for 25 year, Burns didn’t make any promises. “I’m taking it year to year,” he said. 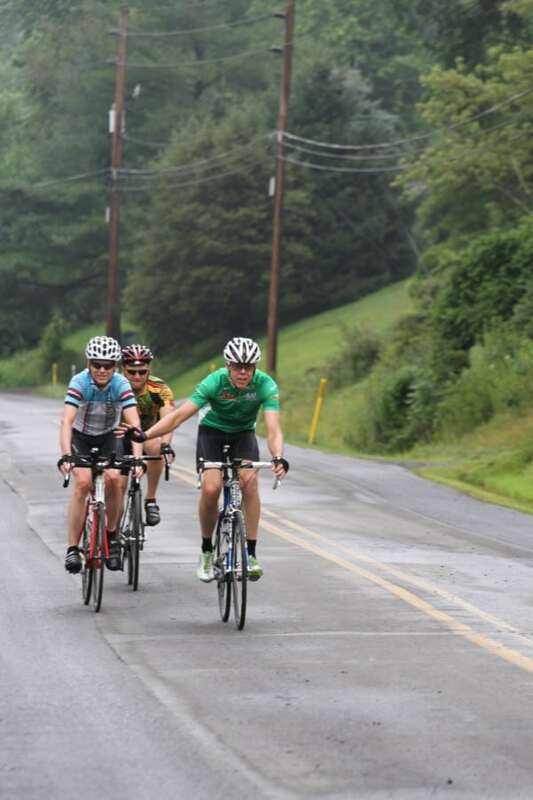 The cyclists pedaled 60 miles from Altoona, Pa. to State College, Pa. on Tuesday, climbing 2,606 feet. On Wednesday, the fourth day of the trip, they will bike 63.7 miles from State College to Lewisburg. When they Anchor House support truck arrive in State College on Tuesday, the Penn State University men’s hockey team unloaded all the luggage for the cyclists. About 45 miles in to the day on Tuesday, some cyclists had an encounter that rider Paul Butterfield had dubbed “the attack of the cows.” A herd of cows ran into the road in front of a group of cyclists. There were about eight to twelve cows within about 100 feet of some of them. “At one point some of the cows were staring at me in the road and they looked like there were wondering what I was doing there,” said cyclist Bill Garrett. One cow then led the others to safety and the cyclists continued on down the road. Krystal Knapp is a participant in the 39th annual Anchor House Ride for Runaways. For more information about Anchor House, to make a donation or to visit an individual rider’s donation page, visit the Ride for Runaways website. ‘Great write up. Thank you.